The internet is saturated with content. We’re all out here, shouting our wares to the world and beyond. Is it just me, or does some of it sound a bit like white noise? It’s getting harder to stand out from the crowd, it seems. When you’re a visitor attraction, this exposure is a complete priority. First, you need to create content that speaks directly to your audience in a way that’s relevant, insightful, and unique. Second, your PPC game has to be spot-on. Together, these will give your audience everything they need to know about your attraction, and they’ll therefore be more likely to book a visit. Now, we have plenty of resources available that will help you with content. 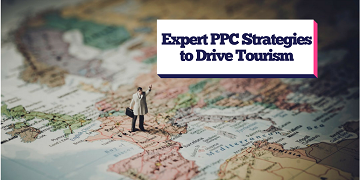 This article, though, is about PPC and how you can use it to implement some fantastic strategies to really drive visitors to your business. You can stand apart from your competition by knowing what you’re good at and capitalising on it. In terms of PPC, you can dominate the SERPs with ads that shout about how your attraction is different to others. When everybody is bidding on the same keywords, you won’t have much wiggle room to try and differentiate yourself. Instead, think about what makes you different and better, and shout about it. Look at what your competition are offering in their ads, and do things differently. Maybe your attraction has the biggest log flume in Europe (definitely something to shout about) or you specialise in sending intrepid holidaymakers to Chernobyl – make use of the ad space. Most paid ads link through to landing pages. This is the standard, and it works. However, landing pages are often the ‘leakiest’ part of the conversion funnel, and by ‘leaky’ we mean the part where visitors are most likely to abandon their searches altogether. Even the most well-optimised landing pages, with the simplest forms, can be prone to drop-offs. If you’re having a similar issue, give call-only campaigns a chance. You’ve got ample ad space in which you can talk about your service – all you need is an enquiry number. It’s an unconventional tip, but one that’s great if you don’t have the budget to create landing pages. Also, call-only campaigns are great if you’re remarketing. In RSLAs (remarketing lists for search ads), you can show these call-only ads to visitors who have already converted. Think about it: at the very least, they’ve been exposed to your brand already. They’ll be comfortable with you. A picture is worth a thousand words, and it’s never been truer than in tourism. That’s why display ads are used to such great effect in the industry. When the image you’re displaying is one of a Mediterranean beach or a beautiful European city, then it practically sells itself! Not that you should get complacent, of course. Make sure you’re getting the most out of your ads, with all of your USPs in there and any other bits of vital information that will help your audience make their decisions. It’s fascinating, some of the things you can do with PPC these days. Introduced in October 2016, AdWords message extensions actually allow users to text businesses directly from the SERPs. It’s easier to track – far easier than recording a phone call and having someone jot down the details – and it’s proven to boost CTR because of how easy it makes the conversion process. A recent Wordstream study demonstrated just how effective message extensions can be: with message extensions applied across five accounts, each averaged 50% greater CTR than the mobile ad alone. Definitely one to consider! To target more refined, accurate keywords, you should pursue longtail terms in your ad copy. Given that these are more specific terms, the number of people searching for these terms will be lower. An advantage of this, though, is that the searchers you do target will be further on in the funnel. They’ve passed through the broader research phase and are now looking at specifics. They may even be using your brand in their searches. It’s vital, then, that you pursue the long tail. We’ve written about this before, at length. Take a look! There you have it: the PPC essentials with which you can drive more visitors to your attraction. In the meantime, we’re going to leave you with another great resource, our destination marketing guide: How to Use Digital Marketing to Sell More Tickets This Summer. If you’d like more information about using PPC, give us a call on 0161 848 4300. Alternatively, you can speak to our Director Kleon. He’s more than happy to talk through your options.